Note: This is a sponsored post in collaboration with ViralSweep. Scroll to the bottom of this post or click here to enter the giveaway for your chance to win a 1 year subscription to ViralSweep, valued at $1,990! ViralSweep makes running viral giveaways easy for brands, ecommerce merchants, bloggers, influencers, and website owners so each campaign successfully helps grow their business and their customer base. Building an email list and social media following are two of the best ways to grow a customer base, but it can be challenging to build these outlets consistently over time. ViralSweep allows any brand to easily build, run and manage marketing promotions like sweepstakes and contests so they can engage their followers, grow their email lists and increase their social following quickly and with the right leads. In this ViralSweep review we discuss everything ViralSweep offers to make this possible for businesses of any size. ViralSweep provides tools for ecommerce merchants, website owners, bloggers and influencers to grow their email lists, increase engagement and generate sales. Their tools enable brands to customize marketing campaigns that encourage each entrant to complete social actions to enter the giveaway, which in turn helps brands grow their social platforms and incentivizes entrants to share the giveaway with their social following. ViralSweep offers 7 different ways brands can run their giveaways, namely: Sweepstakes, Contests, Instant Win, Referrals, Email Forms, Comments and Hashtags – each lending themselves to a specific outcome or objective, allowing brands to run their giveaways the way that works best for them. In addition, ViralSweep also offers their Promote and Network features so brands can team up with influencers or other brands to collaborate on giveaways in order to expand their reach and expose themselves to a larger audience. When it comes to running giveaways, ViralSweep’s system does all the work in terms of collecting data, awarding entries, providing analytics, helping draw winners and they even have an official rules template for brands to use. This makes each marketing campaign on ViralSweep easy to set up, manage and track so it’s a seamless addition to any business’ marketing strategy. 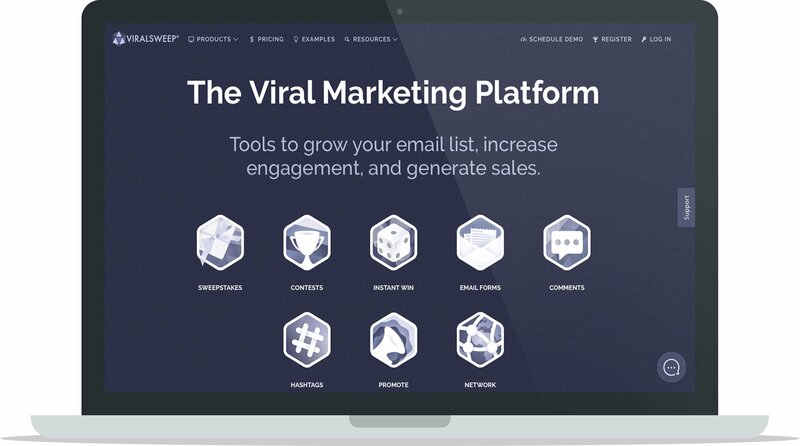 ViralSweep is for ecommerce merchants, bloggers, influencers, brands and website owners who want to capture more emails, get more leads, increase audience engagement, and convert more customers in a fast-paced, viral way. ViralSweep facilitates growth – and makes that growth easy to manage and track – so brands can get the most out of each marketing campaign. Growing email lists is often one of the most important goals for ecommerce business merchants because they’re the key to efficient interaction with past and future customers. With a growing and engaged email list, a business has more potential customers to market to, so for this reason, ViralSweep’s tools are tailored directly towards helping brands grow their email lists. Another priority for brands is social reach and getting their target market to follow them on all the social platforms they use, which can sometimes be slow to grow unless the audience has an incentive to follow the brand. ViralSweep’s apps are designed specifically to reward users for completing actions like sharing, following and referring friends, which can rapidly speed up growth and help brands get more targeted leads. 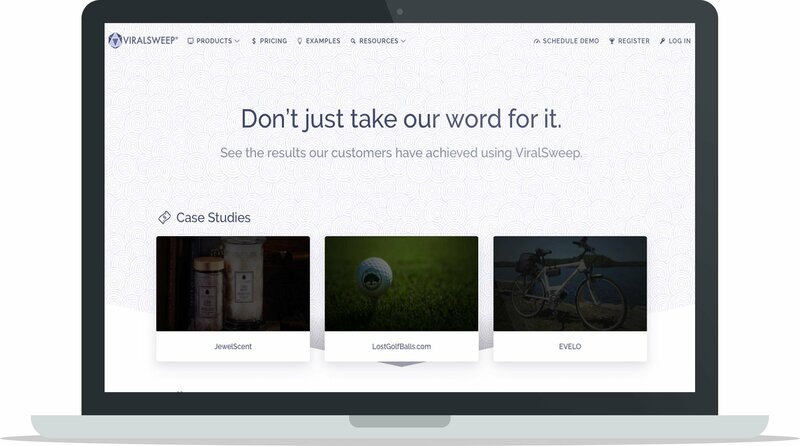 For brands wanting to grow their email lists and their presence on social platforms, all while engaging their current audience and gaining referrals, ViralSweep is one of the leading tools in the industry to help brands achieve this. Check out the video below to learn more about ViralSweep’s capabilities and what it looks like to set up ViralSweep in a Shopify store. ViralSweep provides you with the tools and resources to run successful viral giveaways the way you want to. Want to run a campaign by having your audience submit their own photos or videos? ViralSweep supports that. Want your audience to enter your contest by using a specific hashtag? ViralSweep makes that possible. Want to run your viral giveaways on your website, your blog, and your Facebook page? ViralSweep makes that happen. Want to dedicate an entire landing page to your giveaway, add it to your Facebook page, create a popup lightbox for it on your homepage or all three? ViralSweep can do that, too. 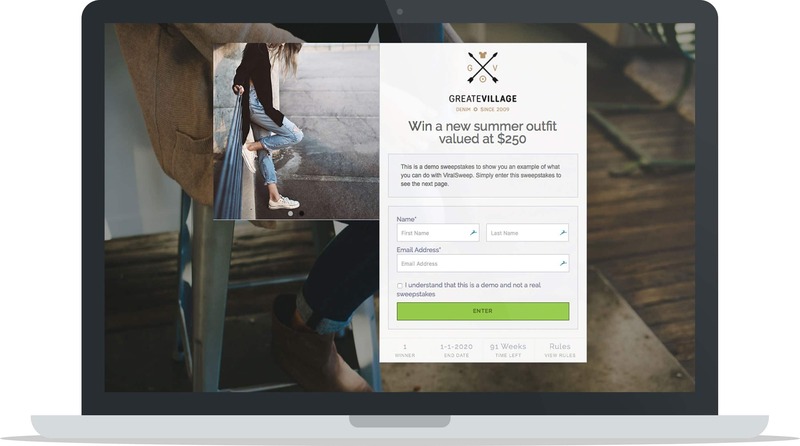 ViralSweep provides many different ways for brands to create their ideal sweepstakes and contest marketing campaigns, plus they also integrate with several ecommerce platforms and email newsletter platforms to make it all possible. Let’s jump into all the features and services ViralSweep offers. 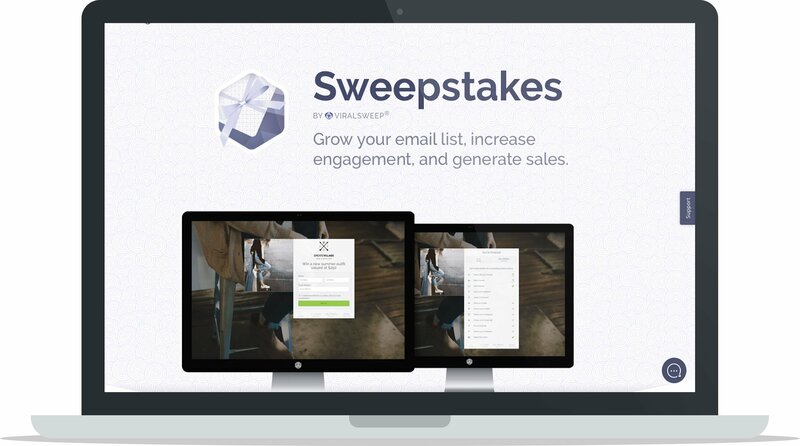 ViralSweep’s sweepstakes app is their most powerful way for brands to capture emails and grow their email list quickly. All a brand needs to get started is a product or service to give away and then follow the steps in ViralSweep’s dashboard to set up the sweepstakes campaign. The purpose of a sweepstakes campaign is for the brand to give away a prize in return for users submitting their information. When creating a sweepstakes campaign, you’re able to completely customize it down to the duration of the campaign, the information entrants must fill out, the social actions entrants can perform to get more entries and much more. It’s all fully customizable so your giveaway works exactly how you want it to. Once you’ve set the sweepstakes up you can run it on your website, blog or Facebook page either by adding it to a landing page, embedding a widget, creating a lightbox popup, or alternatively, they also offer a ViralSweep hosted link you can share so you don’t have to put it on your website. To customize your sweepstakes campaign even further you can translate it into any language, use any of the 12 pre-made themes or create your own theme, add a sense of competition amongst entrants by displaying leaderboards, lock down your sweepstakes to a specific location and much more. Note: To learn more about ViralSweep sweepstakes, check out their sweepstakes app information here, their How to Set Up Your First Sweepstakes video here and an example of a sweepstakes in action here. ViralSweep contests enable brands to run photo and video contests where entrants can submit their own photos or videos to enter the contest. For brands, this is an ideal way to collect user-generated content to feature on their website or social platforms, and they can even feature the submissions in a standalone gallery on their site or Facebook page. In addition, you can even connect hashtags to your contest and ViralSweep will pull that media in from Instagram and Twitter and add them to your contest as entries, as well as display that content in your gallery. 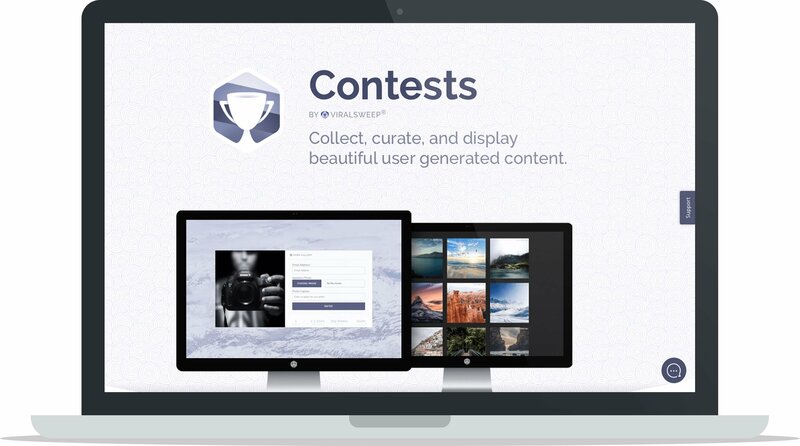 To set up a ViralSweep contest simply decide whether you want to host a photo or video contest and then begin customizing the options in the ViralSweep dashboard. Every option is customizable including whether you want to manually or automatically approve submissions, whether you want the gallery to be sorted by most recent submissions or top voted, turn on or off user voting, collect voters information, change your gallery theme, and much more. Like the sweepstakes feature, you can also determine the contest’s duration, translate into any language, restrict entries to a specific geolocation and encourage entrants to share their contest submissions to receive votes. Note: To learn more about ViralSweep contests, check out their contest app information here, their How to Build Your First Contest video here and an example of ViralSweep contests in action here. 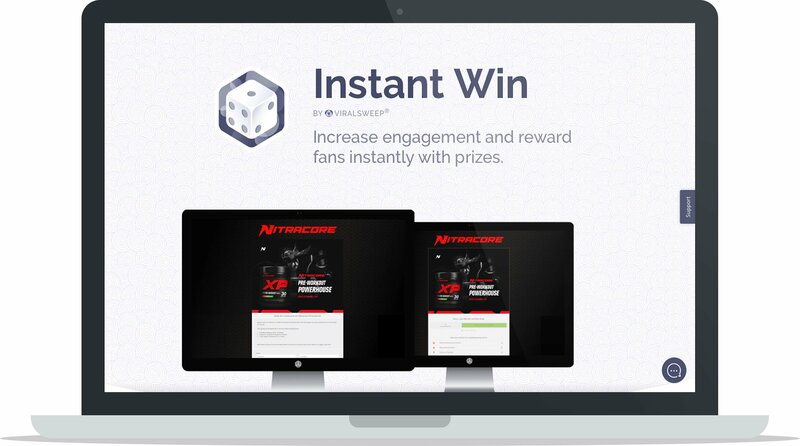 Instant Win: With Instant Win your audience is able to find out immediately upon entering whether they’ve won a prize or not. If a user does not win, they’re given the option to perform social actions to earn more chances. For this promotion type, the system selects winners based on random odds, random times, or unique codes and you can offer as many prizes (including discounts and coupon codes, too!) as you like. Email Forms: If emails are your end goal then the email forms app may be the best option for you. It’s simple to customize and focuses exclusively on capturing audience emails. Comments: Select a winner, or winners, via your Facebook or Instagram comment sections just by connecting your post(s) to ViralSweep and pulling in all comments as entries. Award entries for multiple comments or just one entry per user, connect as many different Facebook and Instagram pages as you like, pull in as many posts as you want and draw random winners with one click. Hashtags: Allow your audience to enter your sweepstakes or contest simply by using a hashtag on Instagram or Twitter. With this feature you’re able to choose the media type that must be submitted with the hashtag (photos or videos), build a gallery of photo or video submissions via the hashtag, allow people to vote on contest submissions and much more. Promote: Work directly within ViralSweep to partner with influencers for your next sweepstakes or contest. All you have to do is submit your campaign, filter potential influencers based on their industry, size of audience and the networks where you want influencers to promote your campaign, then enter in any additional details and pricing and you’ll get paired with influencers. 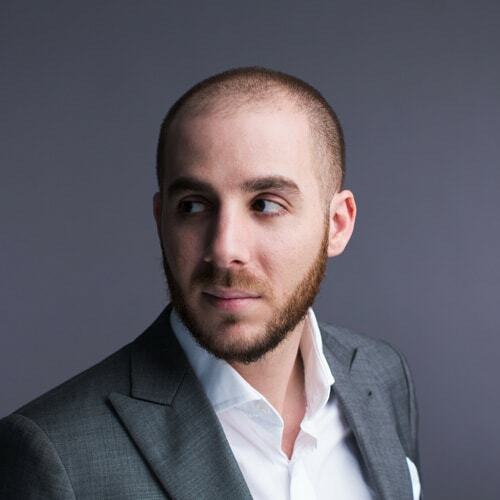 It’s one of the most streamlined ways to work with influencers and one of the best ways to get your products and services in front of a relevant audience. You’re even able to track how well an influencer is driving page views and entries to your campaigns right in your ViralSweep dashboard. Network: Alternatively, team up with multiple brands in your industry, or related industries, to co-promote your next sweepstakes or contest. With an active network of over 500 brands, all of these brands are looking for other brands to work with and all you have to do is invite brands to partner with you. If they accept, you are matched together and given each other’s contact information to work directly with one another. Each brand then promotes the campaign to their audience so you can target customers from a similar market segment. Referrals: ViralSweep’s newest app enables you to run referral based promotions where you award prizes to users based on the number of referrals they obtain. Simply choose the required referrals for each prize tier. Users are awarded a prize when they refer enough friends to reach each tier. ViralSweep automates everything, from the awarding of prizes to the sending of automated referral emails and prize emails. Soon you’ll also be able to use the Referrals app to award a prize every time a user refers a paying customer (like a $10 coupon, or 25% discount code). ViralSweep integrates with a huge selection of other platforms, so no matter where you want to run your contest you’ll be able to without a hitch. Whether you want to run sweepstakes via your website, blog, Facebook page or anywhere else, ViralSweep has the integration capabilities to help you connect. These are some of the tools ViralSweep integrates with, for the full list checkout their ViralSweep Integrations page. Ecommerce Platforms: Shopify, BigCommerce, WordPress, Magento, Squarespace, Volusion, 3DCart and more. 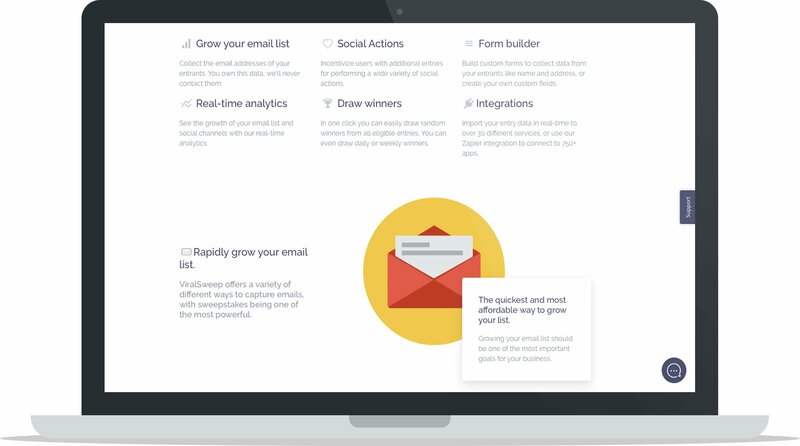 Email Marketing & CRM: MailChimp, Klaviyo, AWeber, ConvertKit, Drip, HubSpot and more. 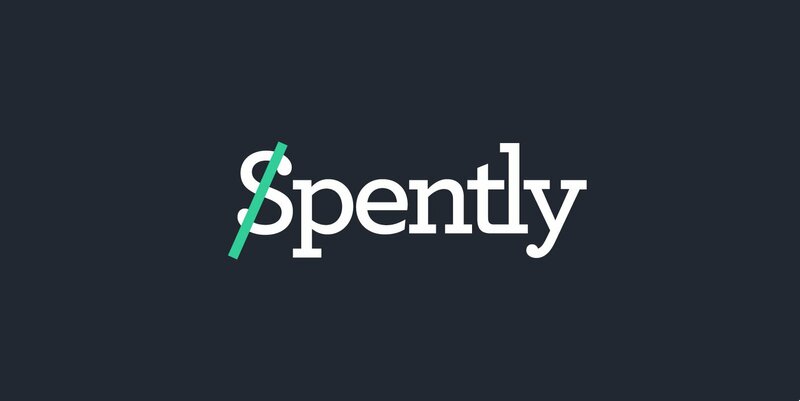 Other: Facebook, Facebook Lead Ads, Facebook Pixel, Bitly, Fomo, Google Analytics and Zapier. JewelScent: Their two campaigns generated $34,215 in revenue (including indirect revenue) with $21,969 of that directly attributed to their giveaways. There were over 43,000 entries in two campaigns. LostGolfBalls: They ran 6 campaigns, collected a total of 33,679 entries, acquired 757 new customers and generated $53,500.05 in revenue. Evelo: Their case study documents them running a Father’s Day campaign that collected 3,187 entries and generated $39,912 in revenue. The biggest advantage of using ViralSweep is the many different options they provide so any brand can create a sweepstakes, contest or giveaway that suits their particular needs. Another huge advantage includes ViralSweep’s customer service and their expertise, knowledge and overall helpfulness that they extend to their customers. Viral Sharing: Incentives to share sweepstakes & contests make campaigns go viral. Analytics: Watch as your audience interacts with your campaigns in real time. Run Campaigns Anywhere: Your website, blog, Facebook page, Instagram comments, Twitter hashtags, etc. 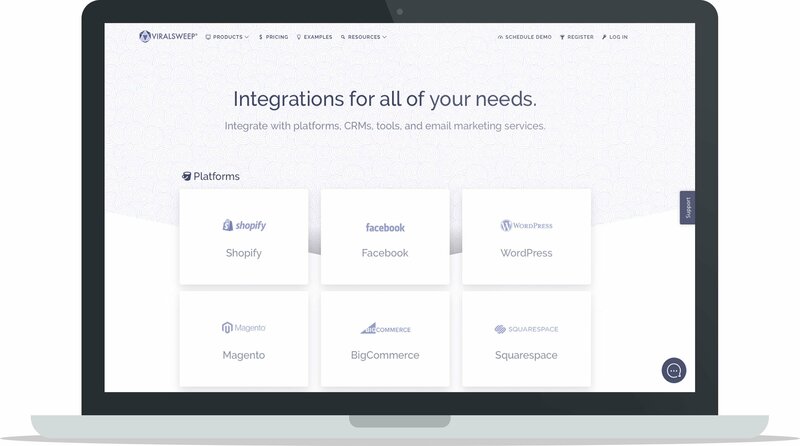 Ecommerce Platform Integrations: Shopify, BigCommerce, WooCommerce, Squarespace and Magento, to name a few. Email Newsletter Integrations: MailChimp, Klaviyo, AWeber and more. Other Integrations: Facebook, Zapier, Google Analytics, Bitly and more. Geolocation Targeting: Run your campaigns in specific geolocations. Billed Monthly: Upgrade your plan or cancel at any time, you’re not bound to a contract. Flat Rate Billing: ViralSweep does not charge per promotion or by the amount of data collected. All paid plans include unlimited promotions and entries. Partner Network & Promotions: Connect with other brands or with industry influencers easily and effectively. Collect the Data You Want: You choose the data you want to collect with customizable forms. Pricing Plans: Not all pricing plans include all features. ViralSweep’s pricing plans operate on a flat-rate basis, meaning their monthly rate is all it costs to use their service. There are unlimited promotions and unlimited entries on all plans so no matter how many promotions you want to run per month and no matter how many entries you get per promotion, your pricing plan stays the same. 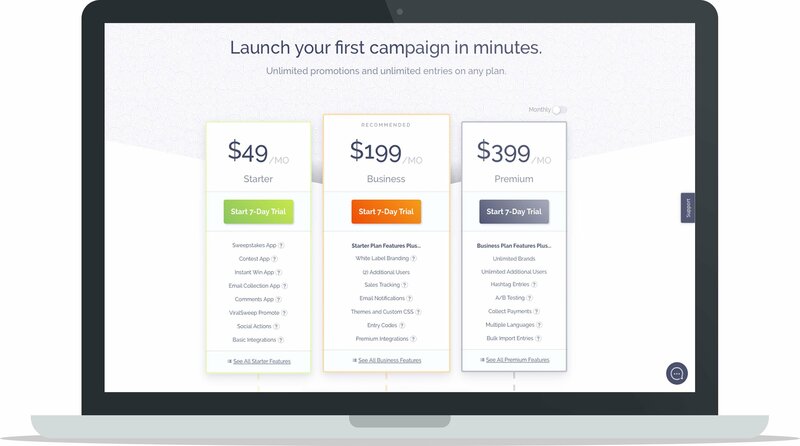 The main difference between the three pricing plans are the features that each one supports. To see the full list of features for each payment plan, check out ViralSweep’s pricing page. Includes all apps plus basic integrations and more. Includes white label branding, additional users, sales tracking and more. Includes hashtag entries, multiple languages, A/B testing and more. Don’t waste any more time slowly building your email list or growing your social following. Use ViralSweep’s customizable and easily embeddable sweepstakes and contests to run viral giveaways that engage your users, collect their information, help you gain traction and boost your bottom line. In this ViralSweep review we’ve touched on a lot of features. To learn more about what ViralSweep can offer brands, check out the ViralSweep Advanced Sweepstakes Guide. For more information on how to collaborate with other brands to co-promote marketing campaigns, check out the ViralSweep Advanced Guide to Partner Promotions. To see all their features and services live in action, check out the ViralSweep Examples. ViralSweep will be choosing one ecommerce merchant at random to WIN a 1 year subscription to their Business Plan! Applicable for any business – large or small – this is a lucrative opportunity to grow your traffic, acquire new leads, increase your conversions and grow your bottom line! TO ENTER: Enter below for your chance to win! Note: This Sweepstakes is being run by ViralSweep. By entering the Sweepstakes you agree to receive email newsletters periodically from ViralSweep LLC. You can opt-out of receiving this communication at any time by clicking the unsubscribe link in the newsletter. A very well-developed post on marketing. These ideas would help us revise and update the marketing strategies implemented in our business.